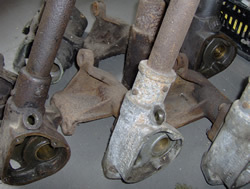 We have considerable expertise in the restoration and repair of steering boxes, especially the Burman bronze nut type. Tired steering gear will render your car almost undriveable in the most serious cases. We rectify all faults by manufacturing and fitting a new steering nut together with sector shaft bushes and rubber oil seals. Where necessary the sector shaft is straightened, hard chromed and re-ground to eliminate wear. The entire unit is bench tested before dispatch. Currently under development is replacement recirculating ball steering nuts and worms for the Jaguar XK120 and Mk 5 models. In other cases, new parts may not be available, so we often have to re-grind or re-make bearing races, fit shims to establish correct running clearances or preloads as well as source good replacement parts to exchange and effect a good repair.